1906 was a tough year for Charles Darwin Gillespie. Gillespie, an infamous saloon owner and liquor runner was being sued for $20,000, a fortune at the time. It was only ten years earlier that Charles Darwin Gillespie left Virginia in a pair of dusty boots, a derby hat, and his only black suit. He arrived in Tucker County, West Virginia and soon after opened a saloon in the county seat of Parsons. Next, he moved upriver to the flourishing town of Hendricks, where the West Virginia Central & Pittsburg Railroad had just come through, and the Otter Creek Boom & Lumber Company was opening a line and a sawmill to haul in and cut fresh timber. 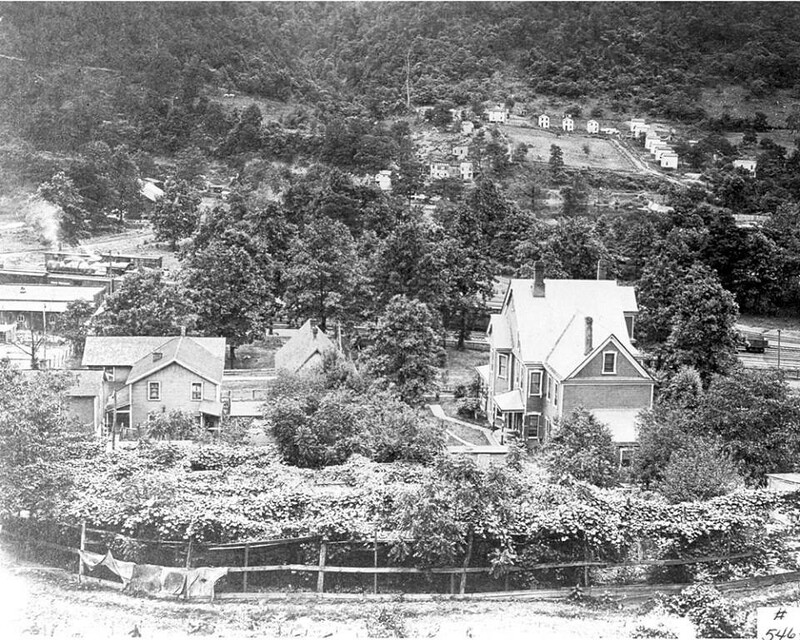 Early photograph of Hendricks, WV, 1894. From the West Virginia & Regional History Collection, WVU. Hendricks was barely a town before Gillespie arrived in Tucker County. The railroad had only begun to puncture the rugged and resource rich mountains of West Virginia before the turn of the century, and boom towns were just beginning to spring up all along the new lines. Like hundreds of other towns, Hendricks was mostly just farmland before, situated at the bottom of a narrow valley where the Cheat and the Blackwater Rivers came together, and flanked by steep wooded mountainsides where the logging companies were busy cutting timber. Log Loader and Crew, Otter Creek Boom & Lumber Co., Tucker County, West Virginia. From the West Virginia & Regional History Collection, WVU. Gillispie quickly made a name for himself in Hendricks. With the confidence of a railroad baron, he bought up land, built a distillery, and distributed booze. And business boomed. He even named a street after himself in a new section of town Gillespie planned to develop. But in 1902, in an attempt to maintain order in the crowded new town, Hendricks was voted dry. Fortunately Gillespie was a shrewd businessman. Over the next year, Gillespie bought up more land across the Black Fork of the Cheat River where he set to work constructing a new distillery. Here, he built houses for his new employees and had a foot bridge constructed over the river to provide access for those customers working and living in Hendricks. In June of the same year, Gillespie had the town incorporated as Brooklyn Heights. He then opened the centerpiece of his new town, the Cream of Kentucky saloon. As benefactor and mayor of Brooklyn Heights, Gillespie hired all the town’s employees, including the local law enforcement, and, of course, had the town voted wet. 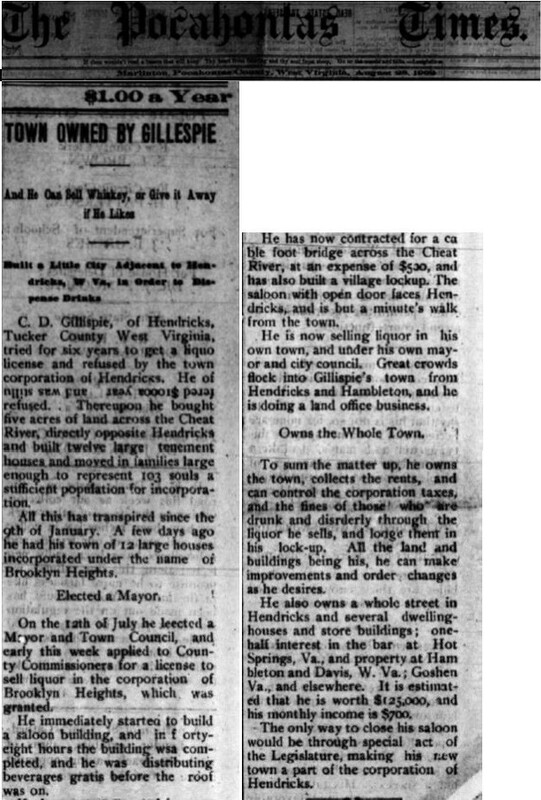 “Town Owned by Gillespie: and He Can Sell Whiskey, or Give it Away if He Likes,” from the Pocahontas Times, August 28, 1902. It didn’t take long for Brooklyn Heights to gain a reputation as a town of thieves, harlots, and drunks. The town consistently made newspaper headlines, announcing new violence, or another murder. A man clubbed to death and robbed. A body found in the river. A carousing husband shot by his wife. Of 12 murders in the town’s short history, there was only one conviction with only 5 years served. 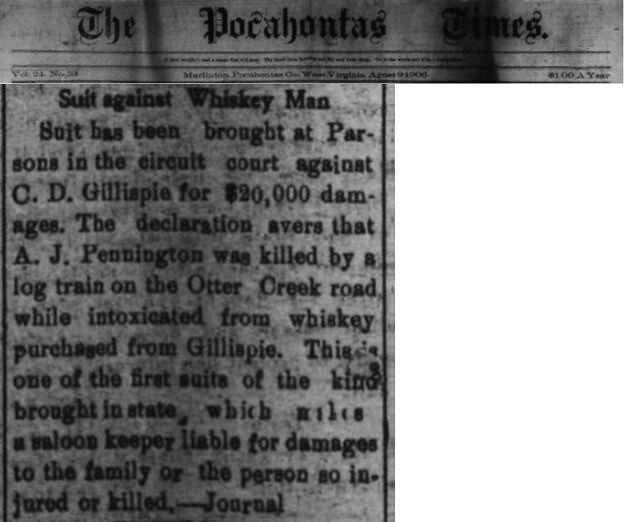 “Suit brought against Whiskey Man” from the Pocahontas Times, August 9, 1906. Things began to go bad for Gillespie in 1906, when a prominent Hendricks citizen left the Cream of Kentucky saloon after a night of drinking on July 25. The man was later found run over on the tracks of the Otter Creek Lumber Company’s railroad. Gillespie and his saloon were blamed and the widow sued him for $20,000 in damages. After going to trial, Gillespie won the case, but the incident gave the county a reason to revoke his liquor license. The Cream of Kentucky Saloon became just a mere speak-easy after that, but in the following years Gillespie must have become tired or bored. Maybe it was the impending Yost Act , threatening prohibition in the state and becoming a reality in 1914, that made Gillespie seek new fortunes elsewhere. It’s said that Gillespie decided to turn to more legitimate business, when he went into a partnership with two other men to finance the building of the Hotel Gassaway in Elkins in Randolph County, West Virginia. In the end, the venture feel through, and all of Gillespie’s properties in Brooklyn Heights, Hambleton, and Hendricks were sold off, and Gillespie was left penniless. After trying and failing to get back into the bootlegging business in Grant County, West Virginia, Gillespie drifted back to Virginia. There, the man who built his little empire in Hendricks, reportedly lived out the rest of his days as a laborer, filling gas or cleaning hotel windows before dying in an asylum in Staunton, in 1933. 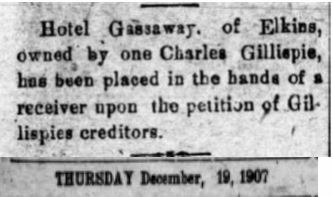 Pocahontas Times notice about Gillispie’s Hotel Gassaway being placed into receivership, December 19, 1907. Like the logging boom it was so dependent on, Brooklyn Heights didn’t last. By 1914 the Otter Creek Boom & Lumber Company had cleared almost all of the timber from its vast holdings in the region, and the logging men began to look for jobs elsewhere. Brooklyn Heights followed the decline of the local logging economy, and it eventually faded, too. Today, on the land where the notorious town once sat, almost nothing from the past life remains. Across the river in Hendricks, the trains stopped running ages ago, but the community endures, and visitors can still find a few houses and buildings from the lumber boom days. The Hotel Gassaway (more recently the Hotel Tygart), in downtown Elkins. Charles Darwin Gillespie invested heavily in this ambitious hotel project and lost his money when he couldn’t afford to finish it. Photo from the West Virginia & Regional History Center, WVU.